I have some background in computer security and one day found myself tasked with assessing the quality of randomness for session id tokens generated by popular web frameworks (namely Java and .NET). As it turns out, NIST have developed a series of tests for just this purpose detailed here. As a non-believer in the absolute randomness of markets, I thought I might take a look at the series of returns from SPX/GSPC to see how they held up. The NIST tests are designed to be run on bit streams from a random number generator, so some liberties had to be taken. I am mainly interested in the predictability of up days vs down days, so I first generated a series of returns using quantmod then encoded them using a 1 for an up day and -1 for a down day and run the tests on the encoded stream. The NIST tests use -1 in place of a 0. The focus of the test is the proportion of zeroes and ones for the entire sequence. The purpose of this test is to determine whether the number of ones and zeros in a sequence are approximately the same as would be expected for a truly random sequence. The test assesses the closeness of the fraction of ones to ½, that is, the number of ones and zeroes in a sequence should be about the same. The tests are done using a significance level of 0.01, so come with a good degree in confidence assuming the underlying method is sound. One caveat is the length of the runs compared and how it relates to the distributions used to model the results. For the monobit test, the suggested input size is 100, requiring 101 days of data to determine 100 up or down days. If we were looking at 32 bit integers, 100 bits would only be 3 “full” random numbers, so arguably we would want to look at shorter time periods (e.g. 3-5 days of data). Given the difficulties around distributions which require a large n, I thought I would vary the significance level instead of a lower n, as our requirements are not as stringent as those for cryptographic random numbers. At a basic level, this series does appear to be random, at least the vast majority of the time with n = 100 and alpha = 0.01. My confirmation bias was very upset with this. 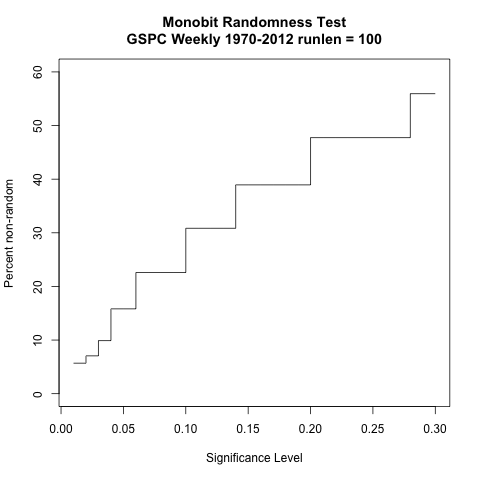 However, if we plot the proportion of runs deemed random vs the significance level, we see the proportion rising as one might expect. One thing that remains unexplained is why this appears to rise in steps rather than something more linear, though I expect this to be a side affect of either methodology or the normalisation done by the tests. I also took a look at the weekly data, which tends to a greater proportion of non-random runs quicker than daily data. I am interested in the applications of machine learning to financial markets. Close to close returns that we have been looking at here are not the only information we have available, nor are they what I trade on a personal level. Also this is only one price series, and one could argue that in practise it is not actually a tradable series. Close to close returns are very useful in lots of applications, but if we are trying to build some predictive model we might need to look for more predictable pastures. Machine learning algorithms are great, but can only do so much. Finding some better potential inputs is what I will take a look at next. The test code is available on github here: R Monobit test. Would be very interested to hear if anyone else takes a look. 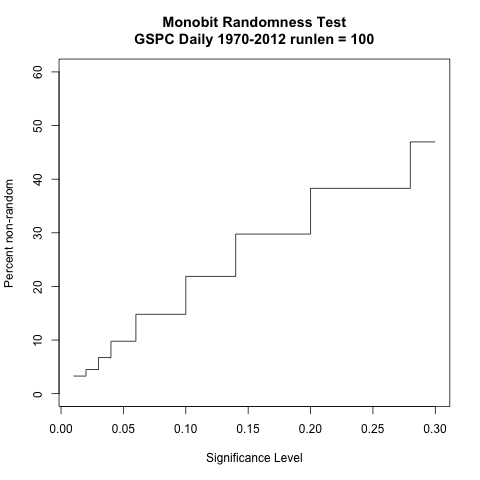 I also took a visual and binomial look at randomness of the series in this post: A visual look at market randomness. Oh and in case you were wondering, the web session tokens all turned out to be very strong. To leave a comment for the author, please follow the link and comment on their blog: Shifting sands.